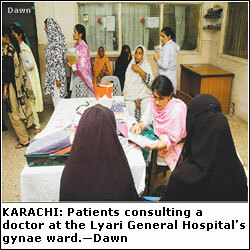 KARACHI, Nov 5: Despite being a major teaching hospital in the city functioning under the board of governors of the Civil Hospital Karachi, the Lyari General Hospital is one of the most neglected public sector hospitals. The numerous problems that plague the services of this hospital are only reflective of the government’s apathy to public health. Security concerns aside, the hospital lacks even basic amenities. This affects the staff of the gynaecology and obstetric department more as they work round the clock to attend to various obstetric emergencies. “Ours is the only department at the hospital which provides round-the-clock emergency services. The department never closes and we do our duties no matter how critical the law and order situation in Lyari may be. This is not a favour, but rather a duty, but we should at least be supported in our efforts and the administration should provide us with basic facilities,” a group of doctors at the hospital said. Like the rest of the hospital, the department faces an acute shortage of water, power outages are a norm while paramedics and sweepers disappear by noon. More perturbed at the situation, though, are the trainee doctors who are finding it hard to face the reality. “The doctors have to administer injections, drips and change urine bags. There are not even registers for making the file of a patient and we have to do this by stapling loose papers together. I thought the CHK was bad, but this hospital is worse,” a trainee lady doctor says. Raising similar concerns, senior doctors said that the hospital administration knew well all the problems afflicting the entire hospital. They claimed that they had to bring water from home not only for drinking, but also for toilet purposes. The hospital generators were used only for operation theatres and labour rooms and there was complete darkness on the rest of the hospital premises during long power breakdowns, which made working at the hospital risky as there was no security guard. “There are no emergency lights in the operation theatres and we keep one on our own because the power supply system takes 15 minutes to half an hour to switch onto the generator,” said a doctor, adding that at times they had to ask patients to buy gloves for the operation. They further claimed that recently a case had to be referred to the CHK because there was no linen in the department. There was no surgical intensive-care unit at the hospital so expectant mothers with complaints of eclampsia or asthma are referred to either the Jinnah Postgraduate Medical Centre or the CHK. The doctors also criticised the hospital administration for not providing them with a separate delivery set for hepatitis patients. “Though all the equipment is sterilised, the standard procedure is to keep a separate delivery set for women suffering from any highly infectious disease. Hepatitis is reportedly more common in patients who either have blood transfusion or went through surgery,” a doctor pointed out. While the law and order situation remains a key issue in the locality, the lady doctors, also at times, have to bear with the hostile attitude of patients. “Aap ko pata nahi ye Lyari hai. This is how they react every time they feel they are being neglected in treatment,” said a lady doctor. Fewer than a thousand women, all of them from socially-deprived background, report at the outpatient department every month, most of whom have a poor record of antenatal attendance. Neonatal mortality (deaths occurring during the first four weeks after birth) and perinatal mortality (deaths in the first week of life and stillbirths) is high with maternal morbidity. “Most of the women are illiterate and believe that doctors opt for an operation to make money. They are not regular in antenatal checkups and report after being horribly attended to by the dais,” she said. According to doctors, almost half of the 500 childbirth operations that take place every month involve cases mishandled by the dais and the rest are registered ones. Another factor playing havoc with women’s health was drug addiction, a doctor said, and that involved even young girls. “This problem affects the health of the mother and can lead to premature deliveries. This compounds the misery of poor women who are already anaemic, living under stressful conditions,” said a doctor. The doctors also lamented the fact that the hospital did not provide a 24-hour blood bank service desperately required to attend to the needs of anaemic women. “We ask attendants to go to the Patients Welfare Association, CHK, and arrange blood for the operation. This is unfortunate since the blood bank at the hospital is unable to fully meet the patients’ needs here,” said one of them, adding that there was no facility at the hospital to have specific blood tests done for any pregnancy complication after 1pm. When contacted on the phone, Chairman of the Board of Governors of the CHK and the LGH Abu Shamim Arif attributed the deplorable conditions at the hospital to an acute shortage of funds while Medical Superintendent Dr Mukhtar Khwaja said steps were being taken to address the hospital’s myriad problems. “Water tankers have been arranged for the hospital while Rangers are also being deputed at the hospital,” he said while asserting that no case was ever referred to any other hospital and there were no problems with the paramedics either.